Never have enough hands to carry drinks to your friends or family? Or do you carry drinks on a tray and use your feet to open / close doors? 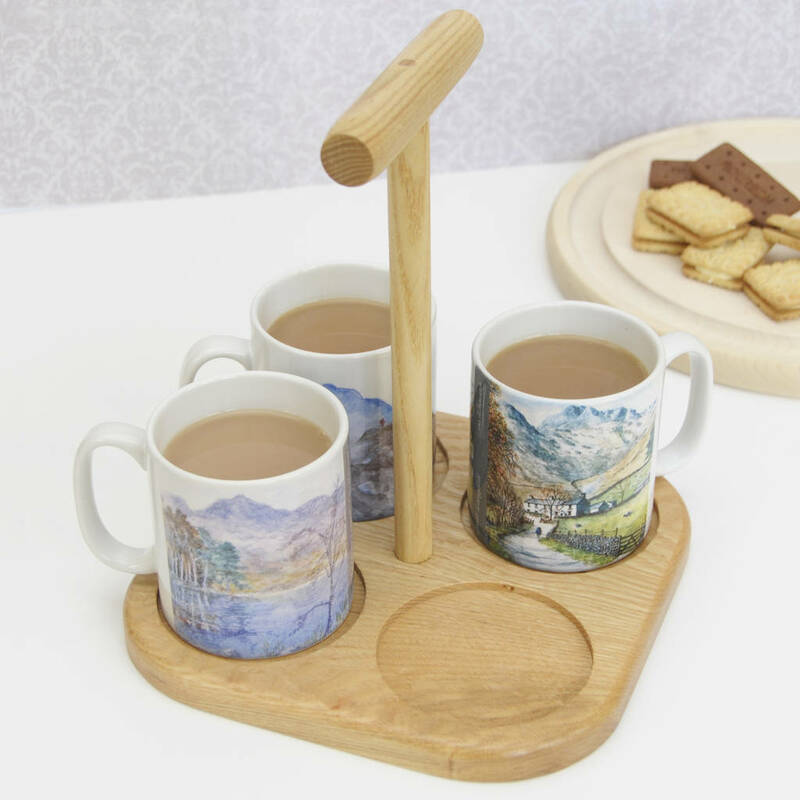 Help is at hand with this unique Cup Carry Tray designed and hand-crafted from solid ash wood by Cairn Wood Design. The carrier, which can hold up to 4 drinks, is lifted and carried in one hand by means of the strong central handle. This leaves one hand free to open and close doors, hold onto a handrail if going up or down stairs or even to carry the snacks to go with the drinks. It will also cut down on the number of trips you need to make to and from the kitchen. As the Cup Carry Tray is held by one hand your body movements are less likely to disturb the drinks so there is less chance of a spillage too. 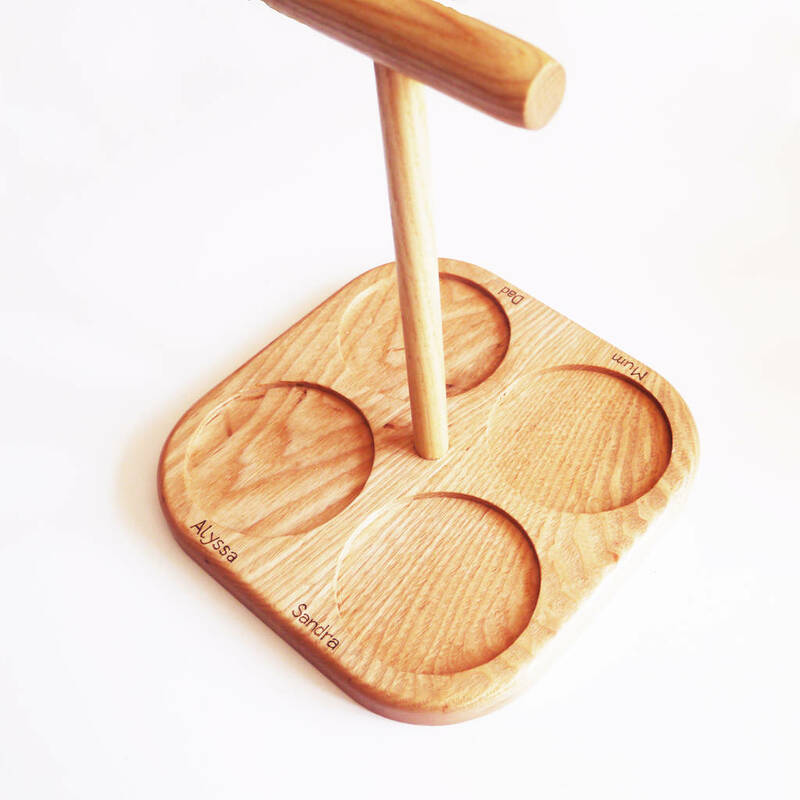 All in all, this drinks carrier is the next best accessory for your kitchen, bar or workplace canteen. 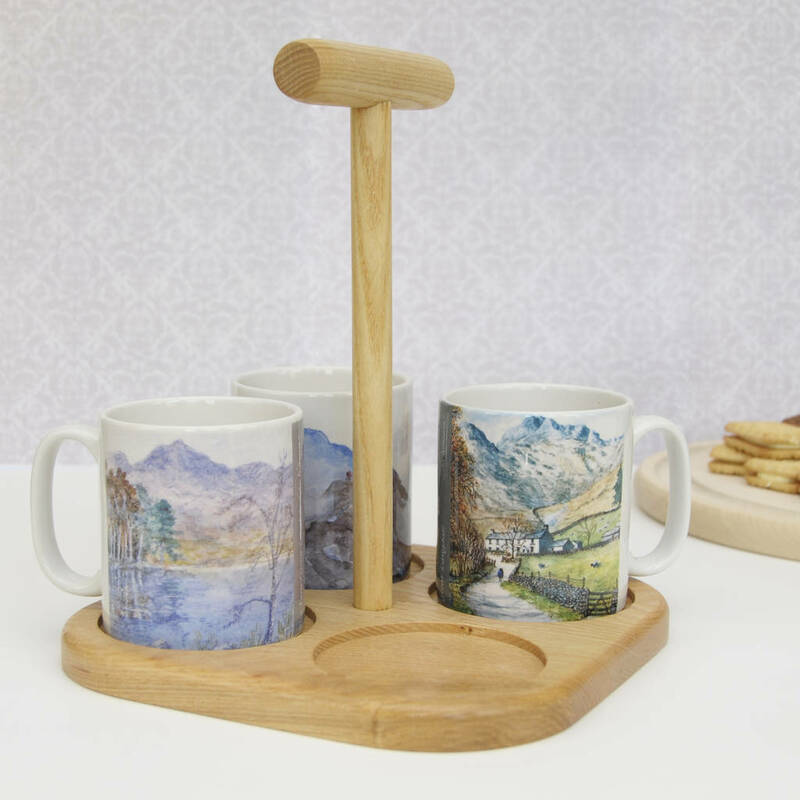 Whether at home or at work this Cup Carry Tray will be a boon to the tea-maker, barman or anyone else responsible for providing drinks. And if that is not enough, to make life even better the carrier can be personalised so that you don't forget who has which drinks - especially handy when your tea or coffee drinkers have different milk or sugar needs! What could be better? See the photograph for an example. 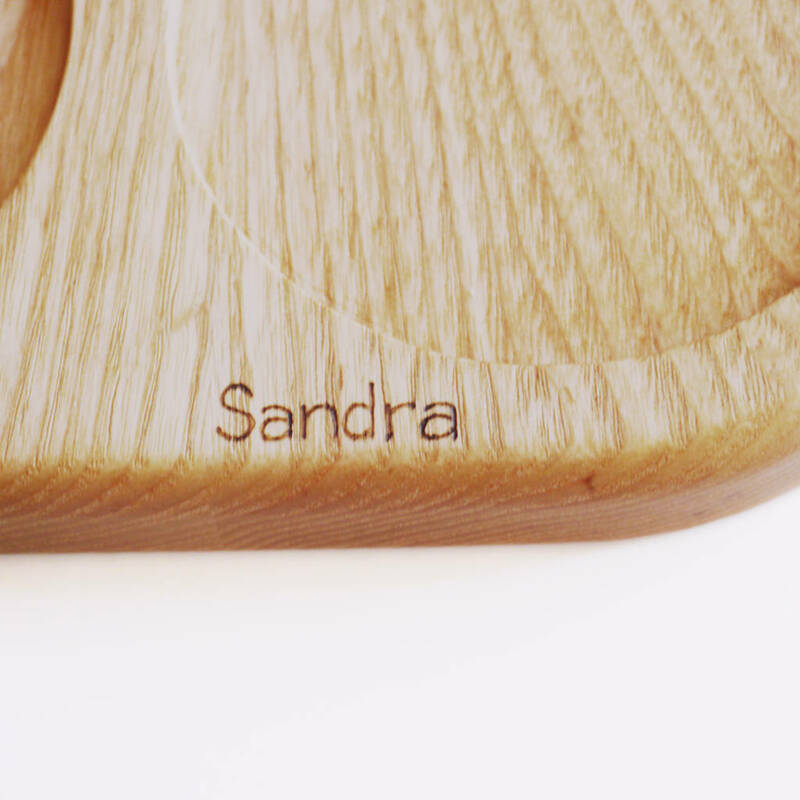 The carrier can be personalised with up to four names or messages of ten characters each. The personalisation is done by hand using a pyrography pen. This pen has a heated tip which is used to burn the lettering into the wood. If you select the personalisation option when ordering, please add your required wording in the Personalisation boxes provided. You can also choose to receive the Cup Carry Tray in a gift box with or without a gift card. The gift card is handwritten and it can have a maximum 80 characters. 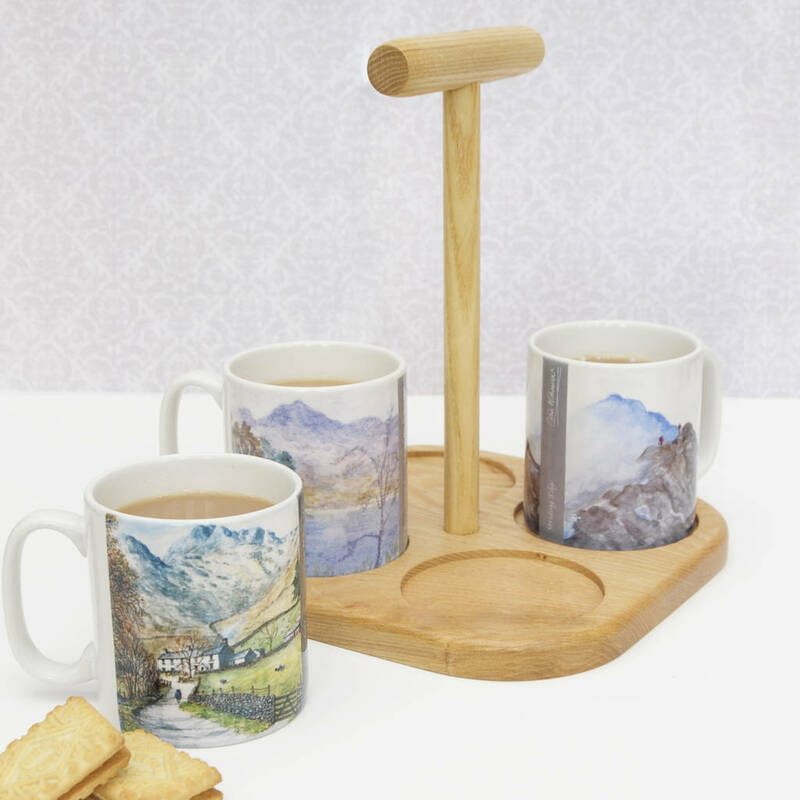 The Cup Carry Tray is made from 100% solid ash wood which is treated with a mineral oil for protection. The Tray can be kept clean with a quick wipe with a damp cloth. The Tray comes flat packed but can easily be assembled with a screwdriver using the supplied screw in the pre-drilled hole to provide a solid construction - it couldn't be simpler! Full instructions will be provided with the product. As wood is a natural product grain patterns and colouring may differ from that shown in the photographs. The Cup Carry Tray, when assembled, measures approximately 21.5cm wide x 21.5cm deep x 24cm tall.